The first A330-800 has taken off at Blagnac in Toulouse for its maiden flight over south-western France. The aircraft, MSN1888, will perform the dedicated flight-physics tests required for this variant. The crew in the cockpit comprise experimental test pilots Malcolm Ridley and François Barre and test-flight engineer Ludovic Girard. The A330-800’s certification development programme itself will last around 300 flight-test hours, paving the way for certification in 2019. Its sibling, the larger A330-900 family member, recently completed its development testing and certification programme which validated the A330neo family’s common engines, systems, cabin and flight and ground operations. 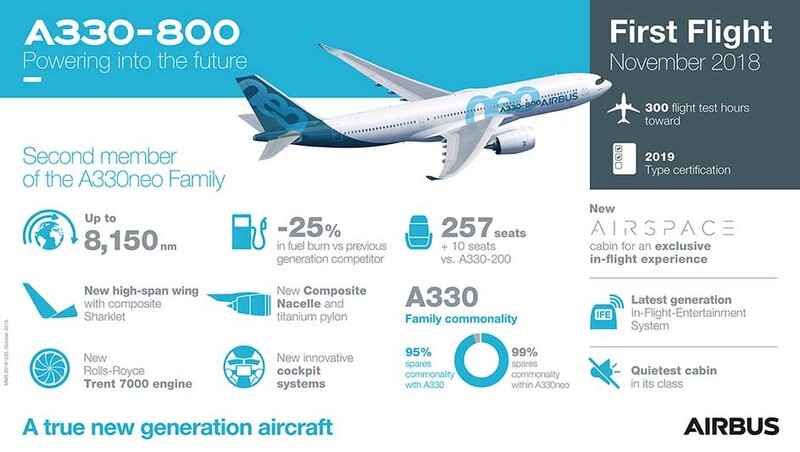 Launched in July 2014, the latest generation of Airbus’ widebody family, the A330neo builds on the A330ceo’s proven economics, versatility and reliability while reducing fuel consumption by a further 14 per cent per seat. The A330 is one of the most popular widebody families ever, having received over 1,700 orders from 120 customers. More than 1,400 A330s are flying with over 120 operators worldwide.